The leftwing media in Brazil may still favor former (and now imprisoned) President Mr Lula da Silva (who will likely be barred from running) of the Worker’s Party or their official candidate Mr Fernando Haddad but they will have a hard time selling this to the millennials and youngsters who are following the news on platforms of their own choice. 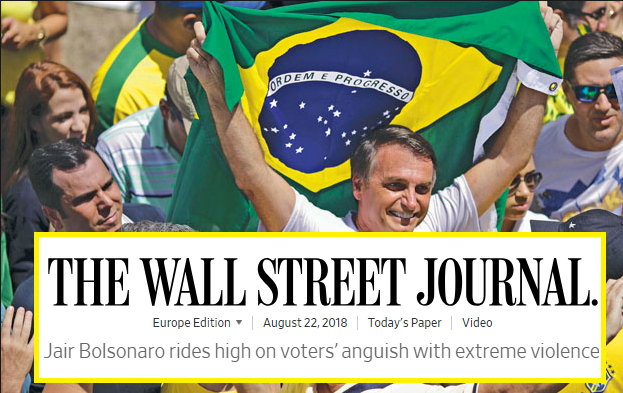 Furthermore, as business media like the US’s Wall Street Journal and the UK’s Financial Times today admit, it is their preferred candidate that is leading the pack for the elections, Mr Jair Bolsonaro (as you could have read in thegoldwater.com several months on end). Related coverage: <a href="https://thegoldwater.com/news/25024-Brazil-Far-Right-Candidate-Leads-Presidential-Election-Polls">Brazil - Far right candidate leads early election polls</a>. The former army captain who has managed to stay untouched by the country’s corrupt political class had gained a loyal following among voters terrified of the epic violence and corruption that has seen Brazil descend into chaos in recent years. In the largest South American nation, plagued with the world’s most homicides, this ex-military man has built an election campaign where law and order are the main themes. It seems to be very appealing as posts on social media show he is indeed drawing the crowds. Mr Rafael Cortez, a political scientist at São Paulo-based consultancy Tendências admitted that the mood in the largest South American nation was peculiar this time round as the election campaign set to be the country’s most unpredictable in three decades kicked off. Related coverage: <a href="https://thegoldwater.com/news/31143-Brazil-Three-Months-Before-Elections-Far-Right-Candidate-Bolsonaro-Still-Leads">Brazil - three months before elections, Bolsonaro still leads</a>. However, as the television campaign season is set to start on August 31st, and more Brazilians have TV rather than internet, the mostly leftwing media in Brazil expects Mr. Bolsonaro to be overtaken by Mr. Alckmin (who currently has 9% of voter support according to a poll commissioned this month by Brazilian brokerage XP Investimentos).